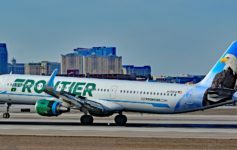 A passenger who was thrown off a Frontier Airlines flight for refusing to part with her “emotional support” squirrel now vows to sue the airline. Passenger Cindy Torok relies on her emotional squirrel, Daisy, to deal with her anxiety. She`ll fit in the palm of my hand. I can cover her up with my other hand. She gives you kisses. OK deboard them! But I am taking my squirrel with me…You will not take my baby from me! If you’re wondering how she got through security in the first place, she claims the TSA had no problem with Daisy, allowing her to hold the little rodent while walking through the metal detector. If somebody brought a rat or a snake or a spider, tarantula onto the plane, I would feel a little creepy. I can sympathize with the people that don’t want her there but she was in a carrying case! Frontier, to its credit, full refunded Torok’s ticket price and gave her a voucher for future travel, despite her antics onboard. But that’s not enough. Now she’s suing. I will own a big portion of this airline. I’m going for blood. I am going all the way. I am contacting an attorney and taking it from there. The lawsuit is not going anywhere, but what do you think about this situation after watching the video above? Does the passenger make any valid points? Sounds like someone looking to make money/get attention from the start. So she’s NOT suing yet. There is no lawsuit filed. She’s threatened to sue. That’s quite a difference. Let’s see her find a lawyer who will take this case. Unless she’s willing to pay upfront there’s not a chance in Hell she will find anyone. Frontier should sue her for the costs they incurred due to her antics. I side with the passenger. No one bats an eyelid when people take dogs and cats and nor should they for a squirrel. Someone opened the Pandora’s Box of support animals, but there’s been an epic fail in documentation of the requirements, at least until very recently. Way to go Cindy! Can I get the name of your lawyer in case I have any problems bringing back my emotional support camel from my upcoming Egypt trip? Don’t these dopey passengers know that the TSA has nothing to do with individual airline rules ? The TSA is security, not an airline !, they don’t decide what, when or where animals go on a flight. LOL, she’s “going for blood”. Please, Frontier, give us the follow-up on this court case. If you’re so emotionally crippled, you have no business flying or doing TV interviews. She looked pretty calm to me. This crap has to stop. No. It’s a freaking squirrel. Can’t wait for an airline to someday take the plunge and refuse to accommodate all emotional support pets! I’ve seen several time the damage a squirrel’s teeth can do and they would be through the cabin walls in seconds if they got the chance. I suspect should that have happened Ms Totok would have needed a lot more than a squirrel to sort out her ’emotional issues’. NO! She make no points that have any validity and she is a person that wants her 2 minutes of fame. This emotional support argument is actually a lot of crap for a number of reasons. These people are using “emotional support animal” to NOT pay the pet charges by the airlines. They pushing the zone of reasonableness by trying to bring everything on board including peacocks and other non-domestic pets. Emotional support animals is not an ADA requirement. Somehow, the FAA has shown an interest in the concept without setting any reasonable limits or boundaries. These non-certified and untrained animals have pooped inside aircraft and even attached passengers. There was a man on a Delta flight that had his face mauled by a 75 dog sitting on the lap of the passenger next to him. An uncontained 75 pound dog turns into a 75 pound projectile during an emergency landing or even hard braking. Squirrels are likely to have rabies. Has this squirrel been tested for rabies? You can’t test a squirrel for rabies without killing it to examine its brain so the answer to that question is NO. What happens when this squirrel escapes its owner on the flight and is running through the plane. Do remember the movie Christmas Vacation when the Christmas tree that Clark brought into the house had a squirrel in it? Require proof of training as an emotional support animal to be reviewed by the airline. I think that I’m going to leave my emotional support gorilla at home. I think that emotional support animals should be limited to squirrels. And for the safety of the animals, they should be certified flying squirrels. Thats the only way I’d ever dream of flying! I’ll give her this – at least she kept it in a carrying case – which is more than I can say for the many who are using the ESA rule to avoid paying for pet sitting while away. It was only 11 weeks old. How could she be so attached to it? She is a douchebag, contact Lionel Hutz for all your legal needs. God help us. An emotional support squirrel?? Is there no limit to this ESA madness? Isn’t there some sort of training an animal needs to be officially classified as an ESA? Say I have PTSD and I’m allergic to mammals, can I bring my emotional support wasp onboard? No? He’s in a box! Get everyone off the plane and I’ll take half your airline thanks!